Let me tell you a little bit about my experiences ziplining. 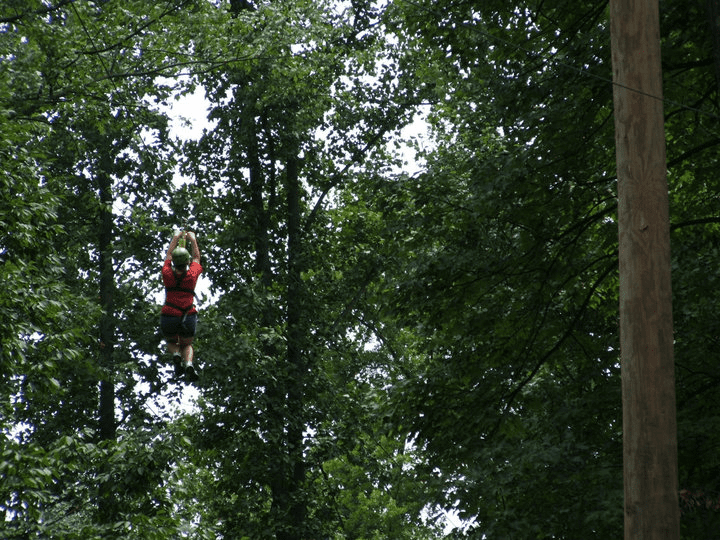 My first time ziplining was in 2010 here at Refreshing Mountain Camp – wow, 8 years ago! Up until that point, I didn’t know too much about the camp. At the time, I was attending a youth retreat camp in Reading, PA. One day, we visited Refreshing Mountain to do ziplining and other activities offered with our designated groups. Although I love the rush of heights, it scares me, so that day I didn’t partake. After our visit to the camp, I made a deal with my mom that I would go ziplining if she went too. Eventually, we went together with a bunch of other people. Afterward, I thought I would never zipline again. In Summer 2016, I had just finished my first year of college and I was looking for a job back home. I found out Refreshing Mountain was hiring so I applied for a kitchen job, but I landed an office job instead. Being a part of the Front Desk staff meant we had to tell customers about the ziplines and the other activities Refreshing Mountain offers. As part of the training, we had to go through all the different activities at the camp, so guess who had to experience all the ziplines? This girl! That summer we did the courses as office staff: myself, along with my manager, and two other receptionists. Boy, I wanted to be tough, but it was difficult. I didn’t like heights, even though there was a safety harness and rope attaching me to the zipline. But guess what? I did it and was totally safe! Do you ever get the feeling of tingling in your feet when you are doing something that you are totally scared of? Well, that’s what happens when I go ziplining – my feet tingle, my knees go weak, and my heart rate increases, but at the same time, I get jittery and excited to be conquering something that scares me. 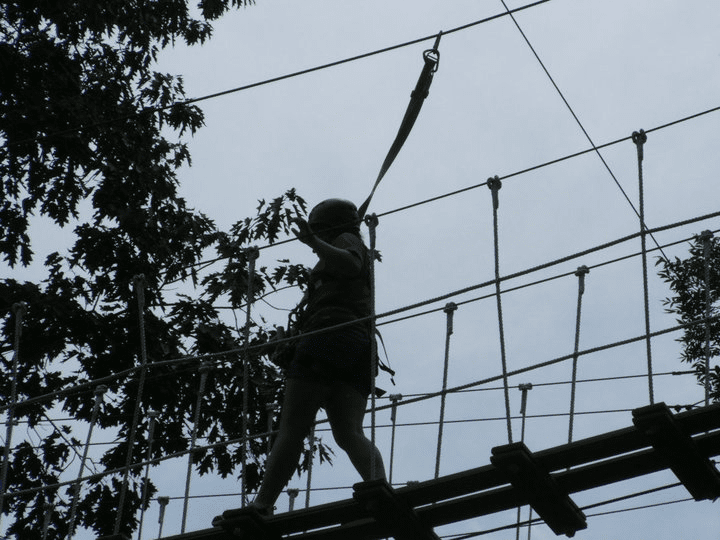 Eventually, I even did the obstacles that are part of the Challenge Adventure Tour, which has 5 ziplines, and the Aerial Excursion Tour, which has 7 ziplines. Once, I fell when doing one of the obstacles, but the safety equipment caught me and I got back up and pushed through my fear. I think the hardest part for me was stepping off the first platform. The same day that we did the Challenge Adventure Tour, while we were on the Aerial Excursion, it started to rain – oh my gosh, that was so much fun. Ziplining through the rain was an amazing experience! Fast forward to this summer, the new course at Refreshing Mountain is the Elevated Obstacle Course, so the office staff went through the whole course – and it was really fun! It was interesting to me to compare this experience to when I did the obstacles on the Challenge Adventure Tour a few years ago. The first time, being new to ziplines, it was especially scary since I didn’t know my co-workers too well. This time around, we were joking with and encouraging each other. It was a great bonding experience with people that I have been working with now for a few years, and that made it extra fun. Are you ready to try ziplining? Learn more about Refreshing Mountain’s ziplining options or book a zipline tour today. Know someone that you’d like to try ziplining? Send them this article to help motivate them to take the plunge! Rachel Rittle is a part of the front desk staff and has been part of the Refreshing Mountain team since 2016.